I discovered this EP pattern a few months ago when I thought about fishing the Texas coast. Everyone knows the crab is the “it” fly in the salt, and that proved to be true! I hooked into lots of nice fish on this pattern. I hope it catches you a fish! 1. Tie in the dumbbell eyes right behind the eye of the hook. Then take the thread back to the barb of the hook. 2. 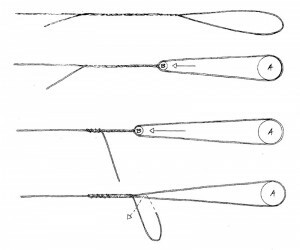 Tie in a clump of marabou at the barb, leaving about 1” out of the back of the hook. 3. Tie in 2 crazy legs, one on each side, and double them over. 4. 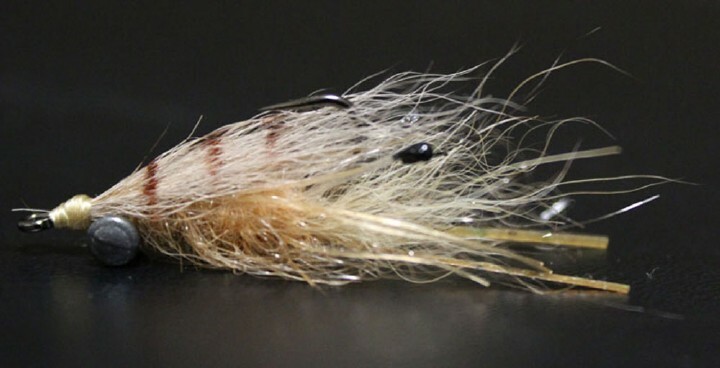 Take a 2-3” piece of ice dub chenille and tie it in so that it is hanging out of the back like the marabou. Then make a 3-4 wraps up the shank of the hook. Tie off and cut excess. 5. Take two mono eyes and tie in one on each side of the hook. Make sure that you angle them downward and that they go slightly past the bend of the hook. Hint: First take some pliers and smash the ends of the mono at your tie in points. This allows for the eyes to be more secure and also reduces the bulk of materials on your hook shank. 6. Flip the hook over. Grab the EP fibers and get pencil width clumps from the bag. Cut both clumps into 4’s (this makes enough clumps for roughly 2 flies). Tie in a blue clump of EP using cross wraps (making an X on top of the EP). Hint: make 3 cross wraps each way. Then grab each side of the EP and pull it back and forth until the EP sticks straight out and is on top of the hook shank. Finally, make a few more tight wraps each way and start the next clump. 7. Optional* Take one rubber leg and tie it in so that there is one on each side of the shank. If you so choose, do this between each clump of EP fibers. 8. Next, take a tan clump of EP fibers and tie them in the same way the blue clump was tied in. Continue to switch colors for each clump until you reach the dumbbell eyes. 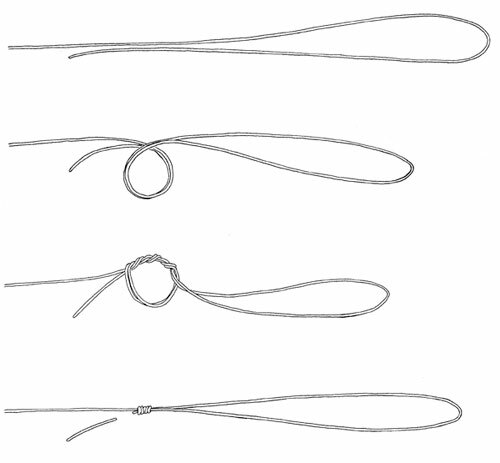 Whip finish and trim your thread. 9. Next step is to shape the EP fibers. To do this, hold the EP fibers tightly out to the side and cut them at an angle. Start close at the dumbbell eyes and end longer at the ice dub chenille. Do this to each side of the EP fibers. Hint: Make sure that your crzy legs are out of the way. The easiest way to position them is downward so that they just hang and are not between the EP fibers. 10. Once the EP is shaped, position your rubber legs back between the clumps. Then take your Loon Thick UV Resin and put a layer of the top and bottom of the shank. This helps with the durability of the fly and also keeps the crazy legs in place. 11. Finally, trim your crazy legs to the desired length.